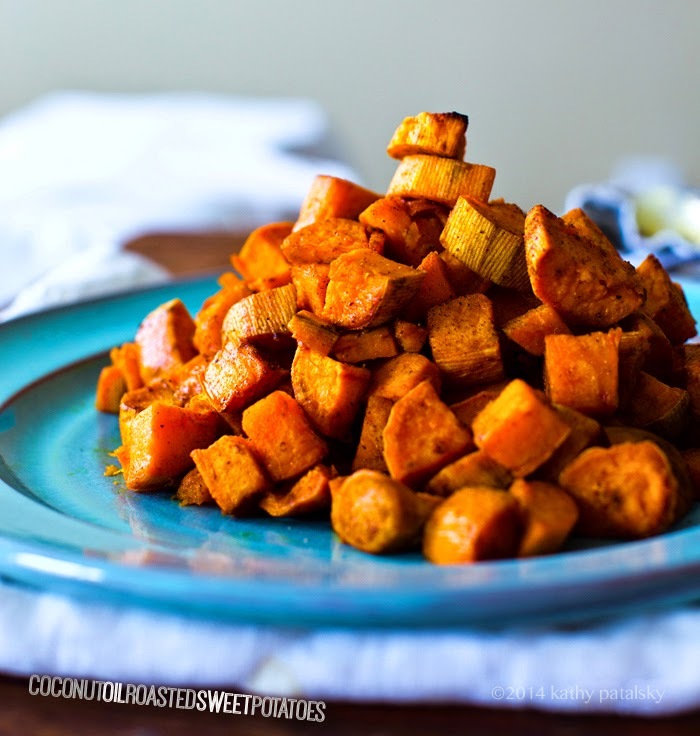 Coconut Oil Roasted Sweet Potatoes. Spices Optional. 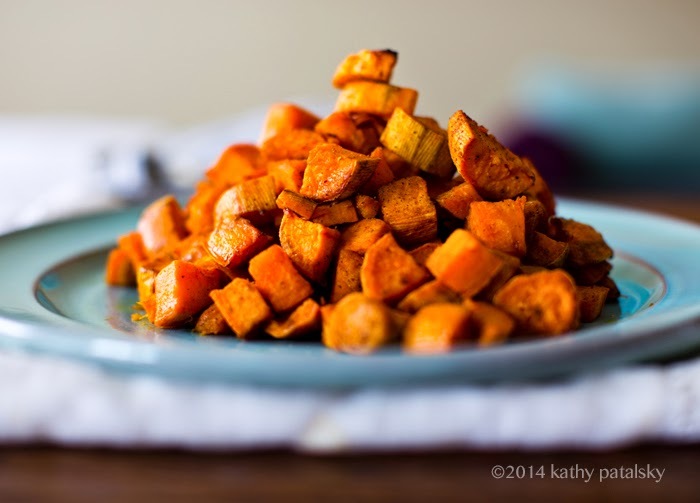 This will be one of your new favorite ways to prepare sweet potatoes. I promise you that. 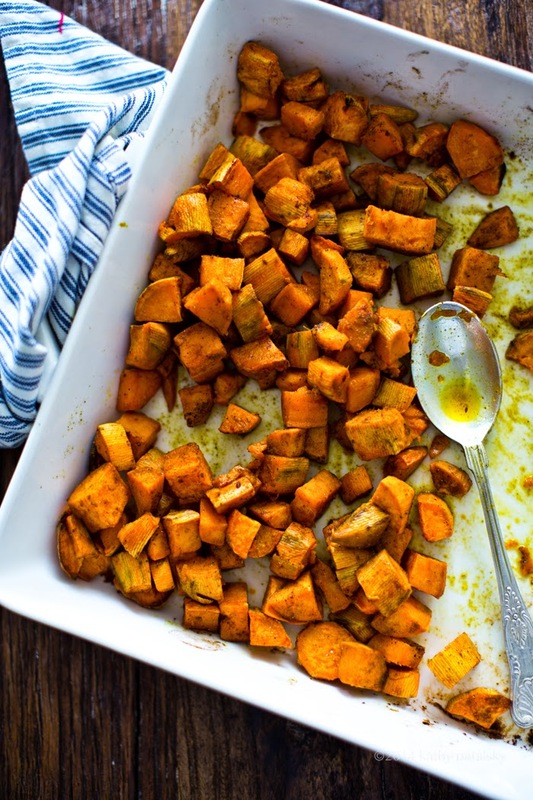 Sure, these Coconut Oil Roasted Sweet Potatoes are pretty gosh darn simple. Like insanely basic. This post barely qualifies as a recipe. The aroma will knock you on your feet when it hits your nose. And you my friend, will understand why this is a must-try, had-to-post-this recipe. The Dish. 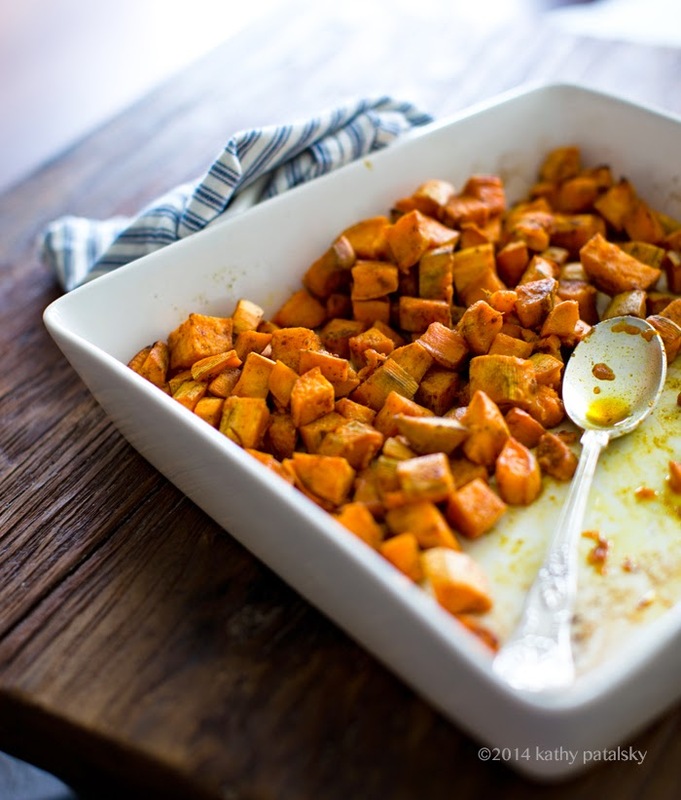 Sweet potatoes all creamy, velvety, sweet and perfumed with their inherent golden swooniness (yes I just said that) are enough to make me excited all by themselves. But add in some tropical breeze-y coconut oil and maybe a few spices and I am out. Gone. In Bali. Or Maui. Maybe Honolulu. Dreamstruck, crumbled up in a ball on the kitchen floor, my right wrist draped elegantly over my forehead as I sleep in a coconut oil roasted sweet potato slumber. OK, not really. But I did feel drunk and happily woozy on the intoxicating aroma. Spice it up. 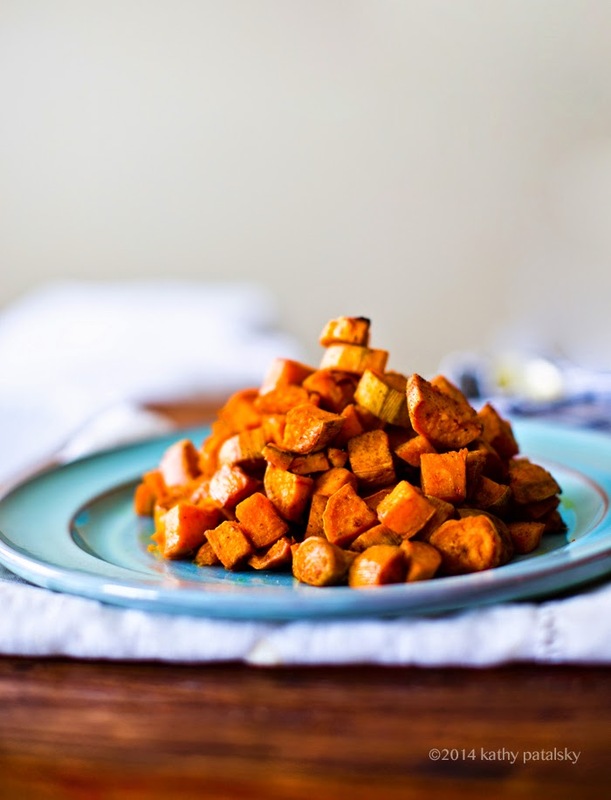 This basic three ingredient recipe is perfect enough, but if you want more swoon for your buck add in some sweet curry powder (if you like curry!) and maybe some cinnamon, cayenne and black pepper too. 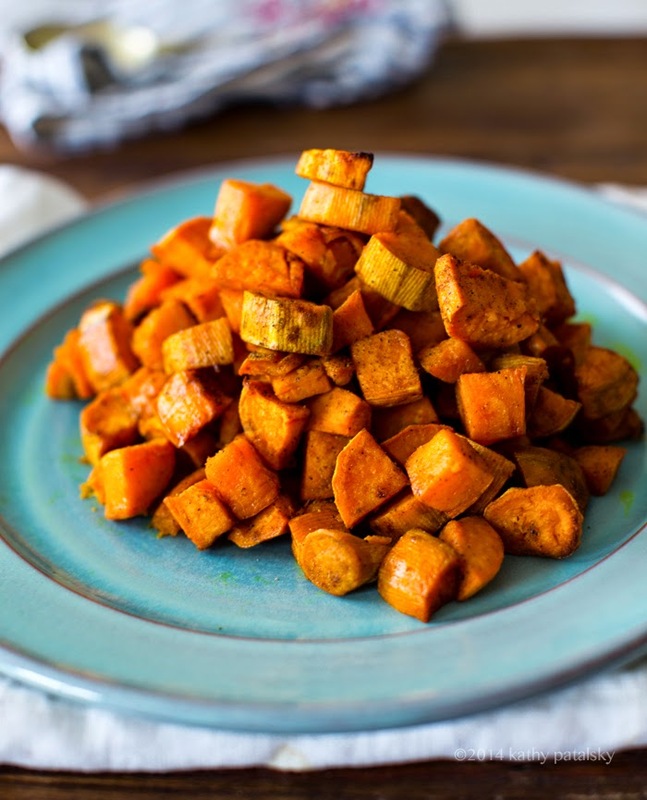 * Use fresh sweet potatoes. Nothing soft or overly spotted. Smooth skin, firm, organic preferred, minimal black spots. Mine were perky potatoes from the farmer's market. High quality potatoes will really help you out here since potatoes are kinda the only main ingredient. * Dice all the potatoes about the same size so they cook evenly. Unless you like a variety of textures, which sometimes I will admit, I do like. Those little crispy bits can be inviting! * Use extra virgin (unrefined) coconut oil. Another oil will pretty much defeat the point of the recipe. Your potatoes will still be yummy, but they will not have that swoon-y coconut aroma. * Spice and flip mid-cook. I add the spices midway through the cooking process so that they do not get burnt. This is about the time that I reach into the oven with my giant spatula and start flipping the potatoes around so it all works out well. * Serve these babies warm or chilled! Both ways are delish. * Make a big bunch at once! I peeled about 4 medium potatoes to get my pile of about 3 cups of cooked potatoes. These potatoes can easily be stored in the fridge for a few days. So make a bulk amount and keep them on hand for adding to salads, soups, wraps, tacos and pasta dishes! If you need to reheat them, I advise doing that in the oven until they are warmed and edges crispy-ish. 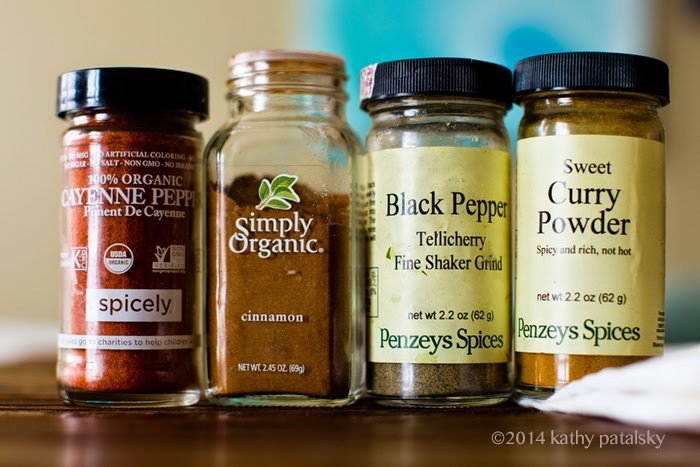 spices to add: sweet curry, fine black pepper, cinnamon, cayenne, smoky paprika, turmeric and more. Add to taste. Start with a few pinches of each. I added about 1/4 tsp sweet curry and a few pinches of the others. 2. 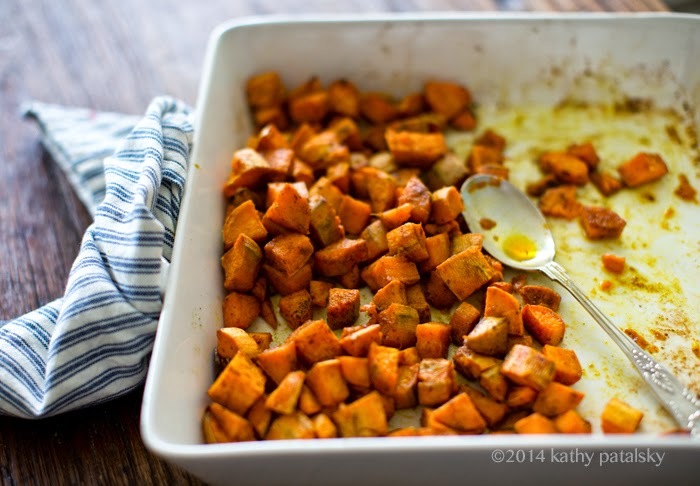 Add the sweet potatoes to your large baking dish and glob in the coconut oil with a tablespoon. Start tossing the potatoes with the oil until the potatoes are well coated. 3. Place the potato dish in the oven and bake for ten minutes. Then pull out the rack and add any spices. Toss the potatoes with the spices very well. 4. Continue baking for 15-20 more minutes or until all the potatoes are tender when pierced with a fork or toothpick. Turn off heat and let the potatoes sit in the baking dish for at least ten minutes to cool before serving warm.